Gray’s residence is situated in a new subdivision only a short walk from the town centre of town. The property offers urban style living on a 450sqm block that boasts panoramic views overlooking the valley’s surrounding mountains and pine plantations from a northern aspect. In the warmer months you can open the external glass doors and enjoy the summer breeze. In the cooler months the glass doors and gable windows offer spectacular views from the warmth of your lounge room. Our client brief was to produce an affordable modern design home by using unique finishes and colours both inside and out. The land being an elevated 450sqm with limited access was always going to have its challenges with respect to design and build. Being of retirement age, our client was not wanting a two storey home that may be difficult for her to maintain at a later date. She came to us to produce a three bedroom, 2 bathroom single storey design that took advantage of its elevated northerly aspect for the views and thermal gains. Building a modern style house with bright colour finishes was always going to be risky proposition. Other houses in the area are of contemporary or cottage style, however our client did not want to be moulded by her age but rather wanted to stand out from the crowd. A low B.A.L. rating was to set the materials to used as an open book, unlike a lot of houses in the area that are restricted. With the increasing risk of fire to the area over the years, it was decided however, to stick with materials with a high B.A.L. rating. 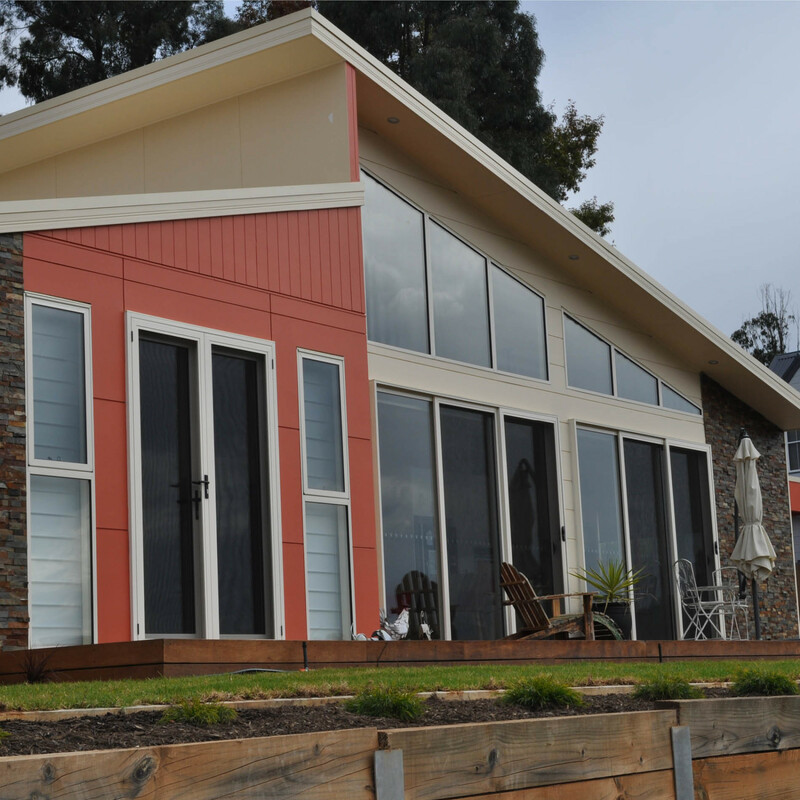 A mixer of Sycon products, Matrix painted in a burnt orange colour “Bazaar”, Axon painted in a mixer of “Bazaar” and “Classic Cream”, Stria and EasiLap, both finished in “Classic Cream” formed the main basis of the external cladding. Decor Stack Stone complemented the cladding on two front ends of the house. A merbu deck flows from the front of the house adding a natural contrast. 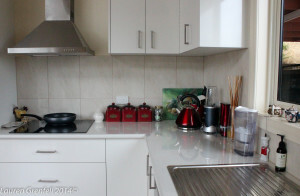 The thermal performance properties of the house come mainly in its design. The lounge, kitchen and main bedroom reside at the front the house which faces due north. A substantial amount of glazing was added to these areas for solar gain, including the high gable in the lounge. During winter months the owner barely uses any mechanical heating, relying on the heat gains through the double glazed windows and doors. During summer, solar gains are minimised with the use of heavy draped curtains. 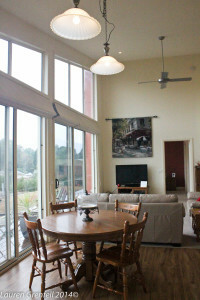 The large double glass doors are able to be opened to increase air flow. With the main living areas, including the main bedroom and ensuite to the front the house, the remaining areas are able to be closed off when not in use to reduce heating and cooling. 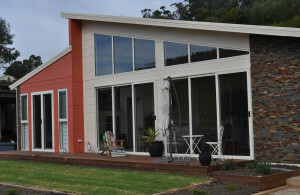 The use of double glazed windows throughout the house and added insulation in the roof (R4.8) and walls (R2.0), along with the design and use of glazing has given our client a very liveable home without the need for mechanical heating or cooling for many months of the year. Being of retirement age, our client was keen to save money in future. An instantaneous hot water system, a water tank to water the garden and LED lights were installed as simply and inexpensive cost saving measures. Grays house has set itself apart from other houses in the area with its modern design and bright colours that has struck an appeal with the local community. The design is simply but advantageous in its northerly aspect, making a very liveable environment for its inhabitants.